Beauty Magic Box: Update to orange lips ! This summer the new red lipstick is orange, but in my opinion orange isn't a new version of anything, it's just orange and it is the lip color of the moment. 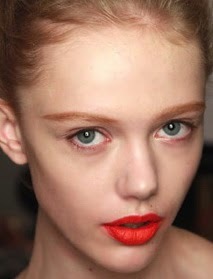 Mat or glossy; orange lipstick is a new make-up trend that will brighten up your face and your summer. All you need to know is how to rock and wear stunning bright orange lips without looking exaggerated or like a sad clown. Everywhere on the runway I spotted orange, so much orange that it made me wanna wear it. But how do we actually wear this bright lip shade out of the fashion-catwalk–life? After I tried 20 shades of orange lipstick on myself and almost got crazy as I could not find something that made me happy, I realized it's better to go for a shade that has more red in it and not so much yellow. Neon orange and orange with a yellow undertone is not so flattering if you have a non-fashion-model face, and to be honest I don't have such a face and probably a lot of you are in the same situation. In the picture above I am wearing Givenchy Rouge Interdit Satin Lipstick 14 Fruity Orange and in one of the pictures I used to fill in my lips with an orange lip-liner (from there comes the soft color difference). I love the texture of the lipstick but as you can see this orange peachy shade is not very flattery for my skin and hair tone, as it has to much yellow in it. The key to success in wearing orange lipstick is to choose the proper color for your skin tone and to keep away the rest of your makeup palette, so don't even think to pair smokey eyes with orange lips. It will be just a big make-up nightmare! If you have fair skin complexion the perfect orange for you must be a pinky orange with very little yellow in it, also it's better to opt for a matte shade of orange just to avoid a washed off tired look. 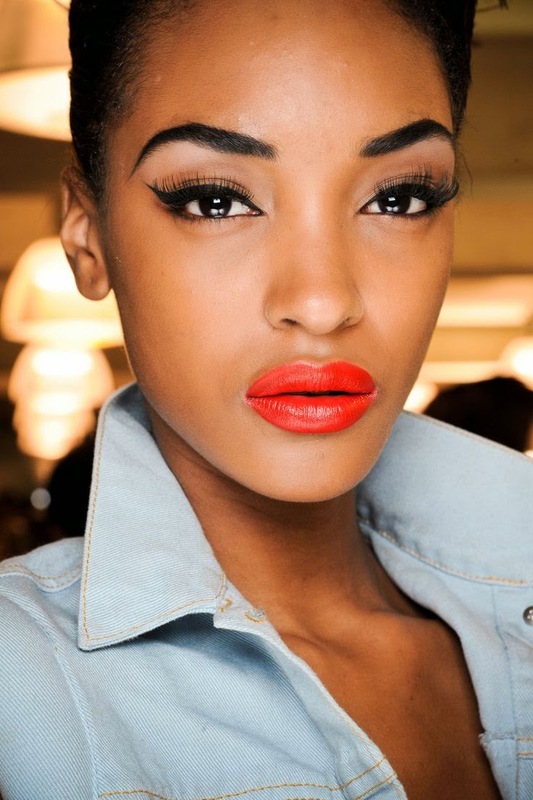 For medium toned skin complexion choose a bright and bold orange. 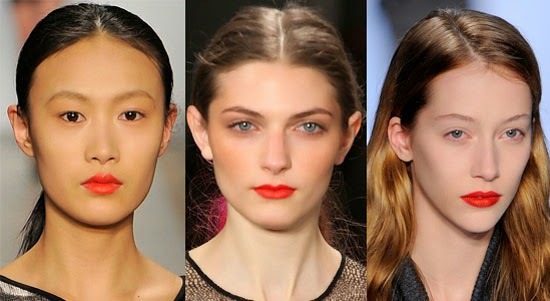 Red-based orange complements the olive undertones and medium skin tone. True orange shades look especially flattering on blondes and women with caramel-colored skin or darker, while red-orange (coral) looks good on most other skin tones. M·A·C Lipstick in Lady Danger, blood orange with red pigment. 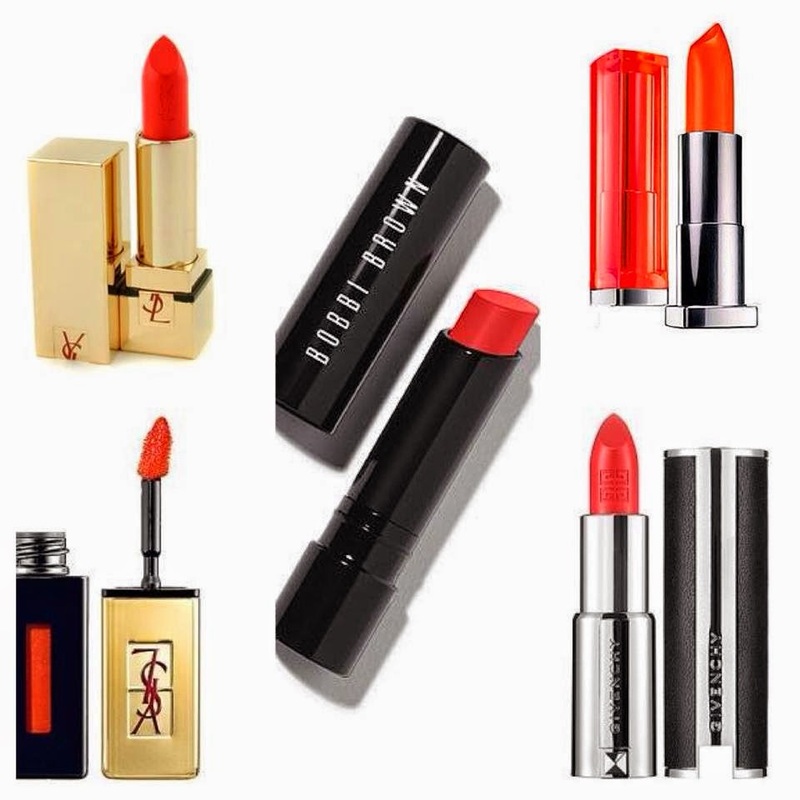 M·A·C Lipstick in Tangerine Dream, I am not gonna mention Morange, oh I did mention it. Giorgio Armani Rouge Ecstasy Lipstick in Tangerine, bright pure orange great for medium dark skin and brown eyes. Maybelline Color Sensational Vivids in Electric Orange, popular on the catwalk! Bobbi Brown Creamy Matte Lip Color in Jenna. Yves Saint Laurent Glossy Stain Orange de Chine. Catrice in Orangina and Lips on Fire. Revlon Super Lustrous Lipstick in Coral Berry. L'Oreal Paris Color Riche Lipstick in Chery Cristal. Bourjois Rouge Edition in Orangina Pop Up. Estee Lauder Pure Color Envy Sculpting Lipstick in Impassionated. 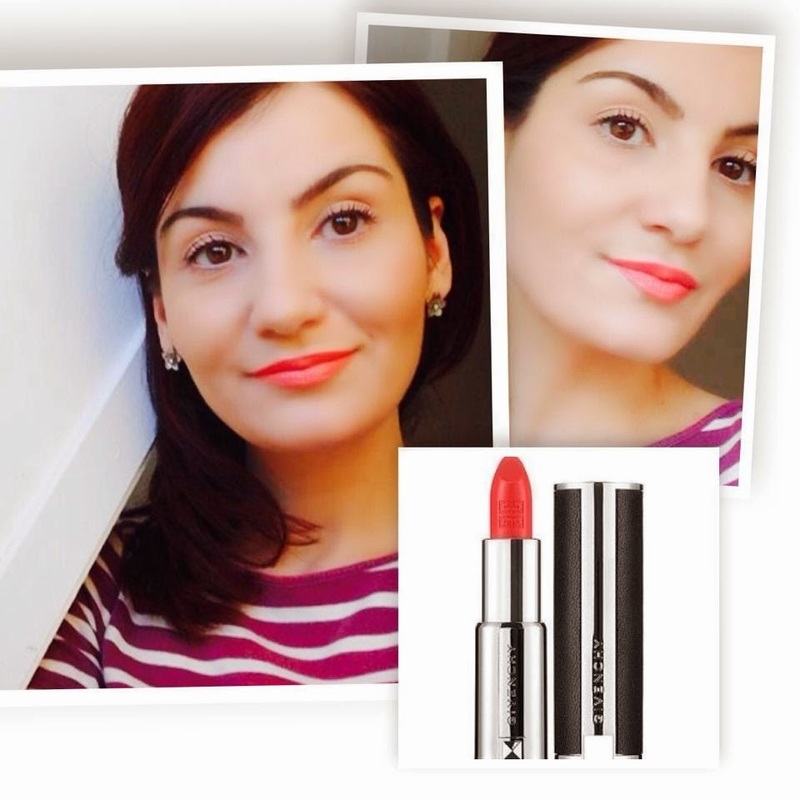 Rimmel London Moisture Renew Lipstick in In LoveWith Ginger. MAX Cosmetics in Fabulous Orange. Orange looks fabulous and warm with red dresses, and romantic and flirty with pink ensembles. Outfits with brown or bronze tones also look fabulous when paired with orange lip tones. 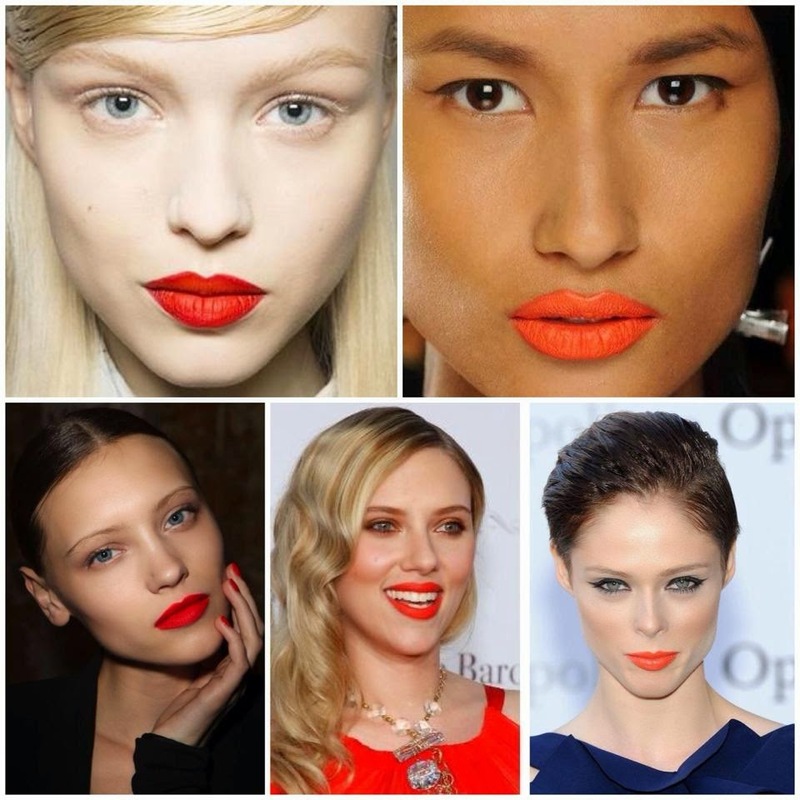 Now let the summer come and be fabulous while wearing orange lips! You convinced me to try it !